Rhone Street Gardens: 2 Plants on My Wish-List! I got news today of two VERY exciting new plants on the horizon (and hopefully MY horizon). The first one I saw when I was paging through a copy of Horticulture Magazine. They were discussing some new and interesting plants coming out in 2011, something which I'm always keen to hear more about. 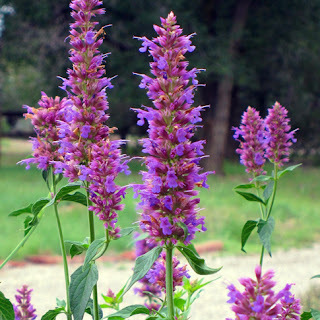 Being introduced by one of my favorite nurseries, High Country Gardens (this picture is from their blog, I hope they don't mind) is 'Blue Blazes' Agastache. It is apparently a cross between 'Desert Sunrise' (a selection they introduced) and Agastache foeniculatum...two great plants, I can only imagine how gorgeous it is in reality. Supposedly long-blooming and generous in size (3-4' tall, 2' wide). I can't wait for this to become available...I am already planning where this will go in my garden! 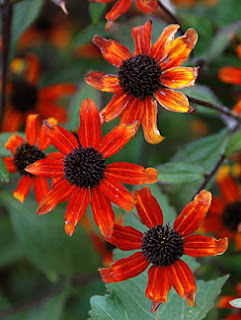 The next plant is one that was brought to my attention by Louis Raymond in a comment to my earlier post on Rudbeckia triloba. He mentioned that Annie's Annuals had a RED version listed, but not available at that time. I didn't waste a moment, but headed over to Annie's website and added it to my wishlist. Well, today I received an email from their website that it was available to order! So much cool news in one day, how can I possibly take it! I'm hesitant to order it now, as I'm not sure if I can safely plant something now and have it survive our winter...has anyone planted this late with success??? In any case, I may bend to tempation now...and if not now, it will be on my order list this spring! My favorite new Rudbeckia! This special strain of good ol’ R. triloba has a mixture of reds & rusts that are oh-so autumnal & warm. A butterfly MAGNET, this Midwestern native grows 3-6’ tall by 2’ or more wide & is considered a short-lived perennial, though it self-sows modestly. If you don’t know R. triloba, prepare to be impressed! The flowers are small (2” across) but profuse. At peak bloom (late Summer or Fall) an established plant can produce 100’s of flowers, MORE per plant than any other Rudbeckia I can think of. This seed strain is not 100% consistent, so the shade of red may not be exactly as pictured & there are some yellow & yellow-red bicolors in the mix. But we do so love the little surprises you get from growing things from seed! OK with poor soil, heat & more shade than most Rudbeckias. Great cut flower! 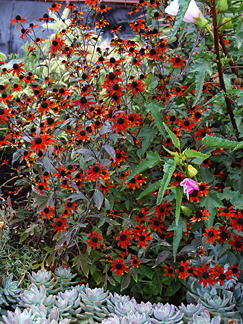 I would love to have that red rubeckia too. Gorgeous! Omigosh I've got drool running down my lip for that agastache! I. MUST. HAVE. IT!!! *pant pant* Thanks for the heads up. These ARE really nice! The High Country catalog always makes me want to do a complete renovation. Nice! Or, SCORE!! Wish my Vikings would score today, speaking of such.